A former coaching inn dating from the 17th century, the Angel today offers 15 boutique style bedrooms. Whether or not the place once played host to Elizabeth I as claimed we cannot be sure (she died in 1603), but other notable past visitors are said to include Hilaire Belloc and HG Wells. 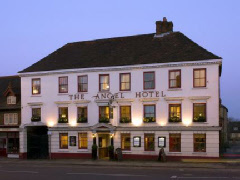 The author A E Housman is also recorded as having stayed at The Angel. The hotel has its own restaurant, coffee house & bar, and is rated as three-star by Visit England.